Locally Developed. Regionally Based. Globally Strategic. Homemade cookies & hot, fresh coffee are always waiting for you at Laurinburg-Maxton Airport. 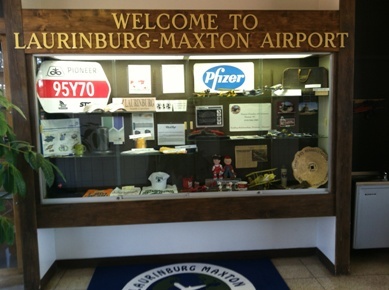 The Laurinburg-Maxton Airport furnished a clean facility with a private pilot’s lounge and bathroom. The terminal building has a full size kitchen with full size appliance. Comfortable furniture in the lobby with a flat screen television for pilots and passengers while they are waiting. Full equipped self-service fuel farm with credit card system for 100 LL AV gas and fuel truck for Jet A fuel for aircraft that flies into the airport after hours. Numbers are posted on the terminal doors for assistance or emergencies after business hours. The regular hours are 8:00 am until 5:00 pm.